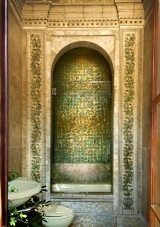 The distinctive bathroom tile design ideas featured here reflect a diverse array of styles from traditional . . . to transitional . . . to cutting edge contemporary. 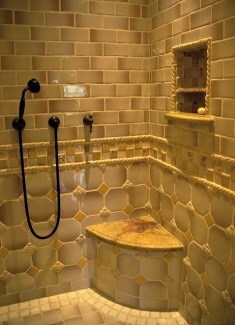 Soft and subtle to bold and daring patterns and color schemes offer a veritable smorgasbord of design options. 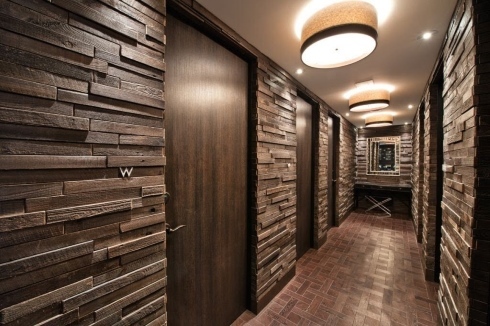 Adding to their diversity is a variety of surface finishes . . . . . from smooth to textural, and matte to metallic. 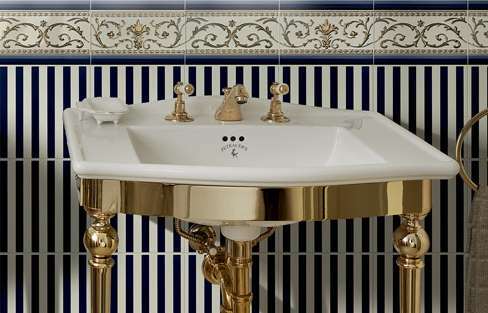 The classically inspired tile design below is from the "Grand Ele- gance" Collection by Petracer's Ceramics, based in Modena, Italy. Wall tiles with bold, richly con- trasting stripes are crowned -- and softened -- by delicate curvilinear forms evoking Re- naissance motifs. 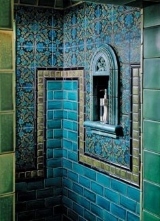 The following shower tile designs embody traditional shapes and patterns that have withstood the test of time. Below, left, a richly colored composition by Motawi imparts a sense of mystery. 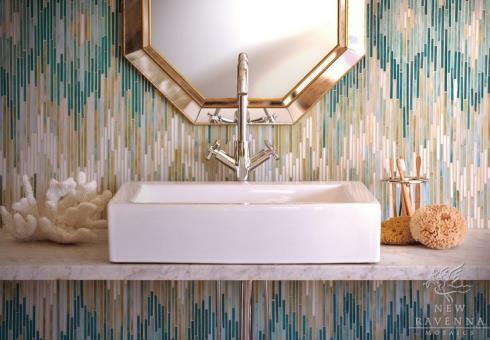 Squares, rectangles and octagons come together (below right) in a striking tile design from Moore-Merkowitz. 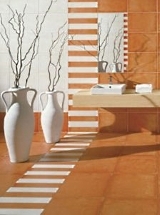 Rope border tiles add visual and textural appeal. 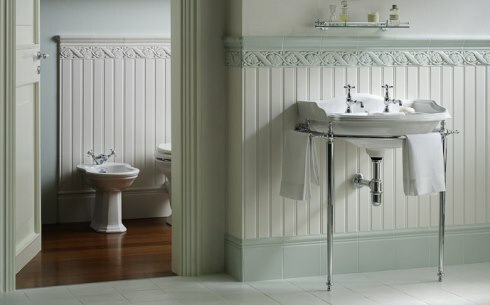 The old-fashioned warmth of beadboard wainscoting is faithfully captured in ceramic in this quaint bathroom tile design from Ceramiche Grazia (below). In addition to verti- cally oriented tile sections, the "Boiserie" series includes a beautifully proportioned baseboard tile and cap moulding -- all of which are available in 3 color options. 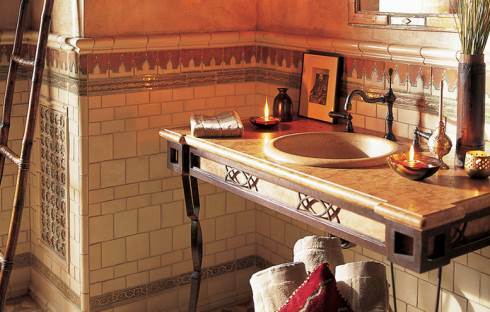 For a more exotic -- albeit equally soothing -- look, the "Ceramica Alhambra Classic" series (below) from Walker Zanger features an old world blend of Spanish and Mo- roccan motifs. 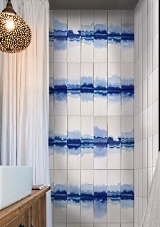 Available in a wide range of shapes, sizes and colors, the tiles offer an unlimited array of creative possibilities! 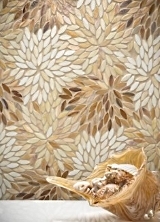 New Ravenna "transforms" textiles to glass tiles. 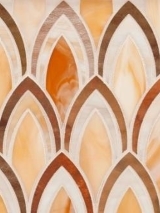 Named for a centuries' old dyeing technique used to pattern textiles -- one that continues to this day -- its stunning "Ikat" Collection celebrates this ancient and increasingly popular art form while providing a durable surface covering for today's baths and powder rooms (below). 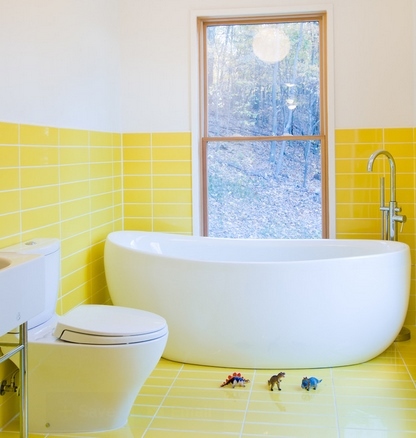 The bathroom tile design ideas that follow push the envelope of "conventional" de- sign. 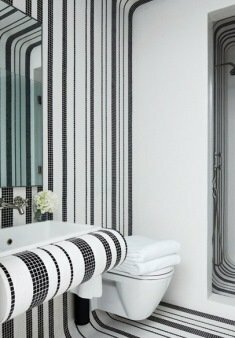 Below, left, is an eye-catching black and white mosaic from Bisazza. 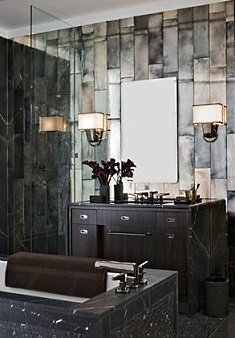 The metallic mirrored bath pictured below, right, features porcelain tiles from Ann Sacks. 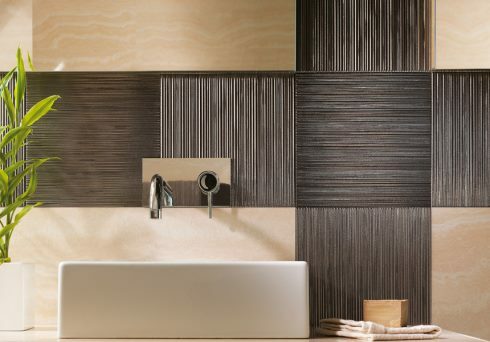 An interplay of light and shadow brings out subtle variations of color and pattern in this sleek bathroom tile design from Villeroy & Boch's "Moonlight" series (below). 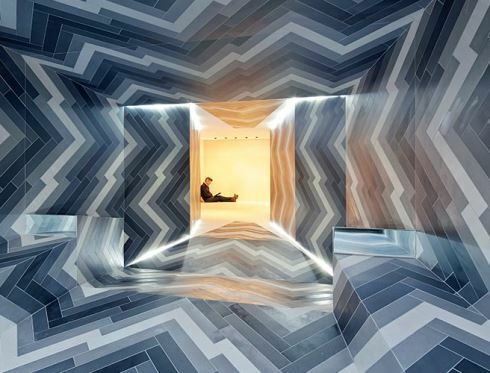 Rectangular in shape, the tiles are available in 15 x 90 cm. (approx. 6 x 36 inches) and 30 x 90 cm. (approx. 12 x 36 inches). 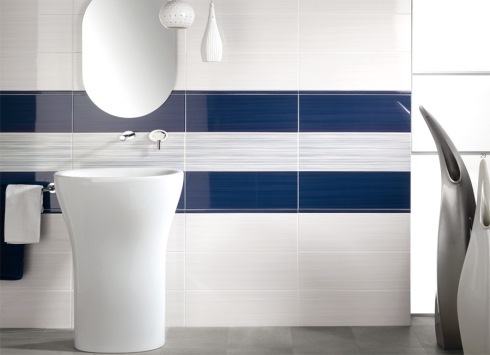 Stacked rectangular tiles with horizontal bands of sharply contrasting hues create a crisp, clean, backdrop for ultra-contemporary bathroom fixtures (below). From Serenissima's "Glossy Capri" Collection, the 8 inch x 22 inch ceramic tiles feature lined patterns for added visual interest. 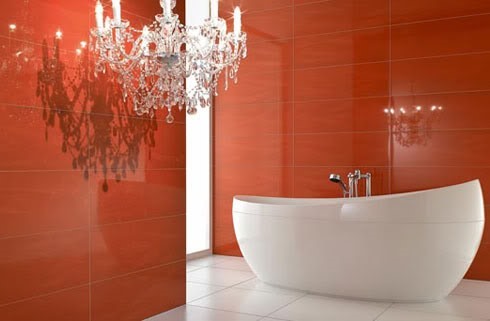 Please check back often or subscribe to our RSS feed, as we frequently add new bathroom tile design ideas to our site.